Grand Bazaar NYC, formerly known as GreenFlea Market, has been operating every week, rain or shine, since 1985 on the Upper West Side of Manhattan, making it one of the oldest flea markets in New York City. It was among the first open air markets in the city, and it still considered today one of the best indoor and outdoor weekly flea markets in Manhattan, with its positive and vibrant shopping environment that reflects New York City’s originality and diversity. With its large variety of antique, vintage, and handcrafted merchandises sold by 140+ new vendors and long-standing customer favorites, Grand Bazaar NYC is the ideal place to look for something different to give or to keep. A more extensive list of typical items that can be found at Grand Bazaar NYC include antiques, vintage collectibles, new handcrafted items, jewelry, furniture, clothing, new and vintage furniture, rugs (both old and new), lighting fixtures & parts, architectural salvage mantels, mirrors, China, glass, vinyl LPs, antique maps, new & used books, and custom eye-wear. Flea market enthusiasts will find wonderful things at reasonable prices — most of them probably not available anywhere else. Some of the handicraftsmen at the market also offer custom-made merchandise, from jewelry to furniture and clothing. In fact, the vendors take pride in helping shoppers find just what they’re looking for. 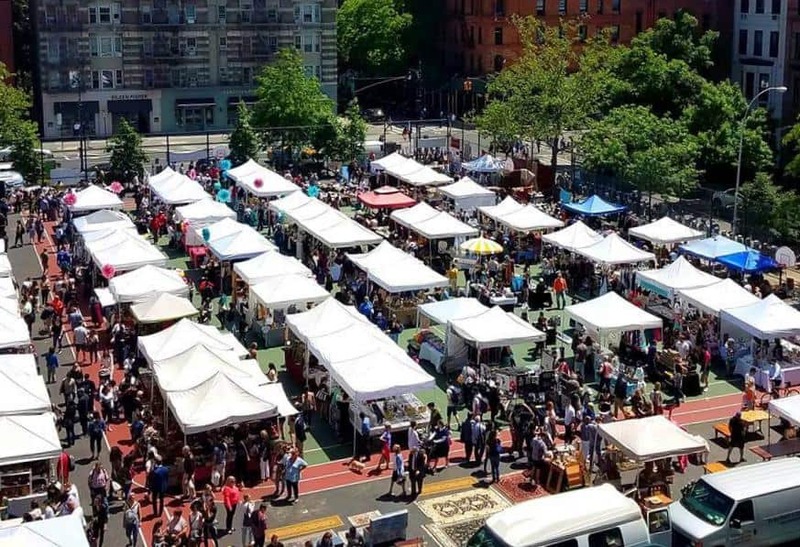 Last but not least, special themed events and pop-ups highlight the different categories found at the market, and the organizers of Grand Bazaar NYC are always featuring new one-of-a-kind vendors throughout the year. Grand Bazaar NYC truly has something for everyone, as this unique and dynamic market features talented local artists, designers and craft-makers, reputable independent vintage and antique dealers, and dishes from delicious artisanal food vendors. The icing on the cake? Shopping at Grand Bazaar NYC is a good deed, as this flea market is the funding source for four public schools in the surrounding neighborhood. 100% of profits from the market benefit over 4,000 school children.